Once a model of stability, the Inspirations have had a relative flurry of personnel changes in the last few years. So much so, that the release of It’s in the Savior’s Hands marks the first time the legendary quartet has recorded consecutive studio albums with the same vocal lineup since the longstanding Archie Watkins/Matt Dibler/Melton Campbell/Mike Holcomb lineup released How Great It Is in 2008. As I stated last year, the Jodi Hosterman/David Ragan/Jon Epley/Holcomb lineup is a significant vocal departure from the classic Inspirations sound dominated by Watkins’ power mountain tenor, but that isn’t necessarily a bad thing. In fact, It’s in the Savior’s Hands further solidifies the fact that the boys from Bryson City have their best vocal blend ever. The newest Inspirations release has some things in common with last year’s stellar God Makes No Mistakes, which gives a sense of continuity with this vocal lineup. Most importantly, the basic sound is still predominantly classic Inspirations. The accompaniment is piano-dominated, with help from David Johnson’s assortment of acoustic stringed instruments. This group, perhaps more than any other, is very committed to giving their fans what they’ve come to expect. “If it ain’t broke, don’t fix it” is the prevailing attitude. In a day when many groups are trying to test the waters of all kinds of sounds, with varied levels of success, the Inspirations are sticking with what they do best. I don’t begrudge a group for getting outside their comfort zone, and there’s definitely a place for that, but I find myself refreshed and comforted when I pop in a new Inspirations CD, and that piano and steel guitar ring out again. It’s clear from the first two albums by this lineup that the group recognizes the individual singers’ strengths, and utilizes them well. Hosterman is not what you’d consider a big-time power tenor, so the slower, melodic ballads are suited for him. Baritone Epley is at his best on the mid-tempo fare, while the fast songs are left for Ragan’s solid lead and Holcomb’s dependable bass. Sometimes I think groups tend to overthink things…”well, we haven’t had a good bass-solo ballad in a while,” or “our lead’s gotta have a power ballad”. Credit Martin Cook’s leadership and Jeff Collins’ production for putting the right songs in the right hands. The re-cuts stay remarkably true to the original Inspirations arrangements, but most of them just plain sound better with the new vocal blend. The strongest of the re-cuts are the two uptempo, Mike Holcomb-led, convention-style songs. I can’t really choose the strongest between “In the Twinkle of an Eye” and “It Won’t Be Long”. The former has a more creative lyric and melody, while the latter is a more traditional convention number with some nice vocal moments. Their common feature is that the Hosterman/Ragan/Epley trio, more elastic in their range, reach up for more impressive harmonies than on the original versions. And you know you can’t go wrong when you turn Holcomb loose on songs like these. The two weakest songs on the project are also among the re-cuts. “He’ll Hold My Hand” and “Shoutin’ Time” are a little bit overdone for me personally, and there’s nothing in the cuts here that distinguishes them strongly from others. That’s not to say they are bad; this vocal lineup sounds great on everything. But the arrangements are not special. The strongest songs on It’s in the Savior’s Hands are the four new cuts. The opener, “I’ll Never Sail Alone,” is a straight-up, steel guitar-led, Inspirations quartet number. They break out some counterpoint in the last chorus to add some good variety. You’ll tap your toe, and you won’t be able to help it. Along the same lines, but led by some light electric guitar as opposed to the steel, is “Lord, Stir the Wind”. It is a Sandy Knight-penned plea for revival, with a festive quartet groove. The title track is a wonderful Squire Parsons lyric, delivered expertly by Epley. The newest Inspirations singer’s range approaches two octaves on this traditional mid-tempo number that has some Jeff Collins organ accompaniment along with his piano. It is the project’s first single, and I would not be at all surprised to see it result in another Inspirations radio hit. Finally, I’ve got to disagree with David Bruce Murray when he says that “no song” on the new project takes the quartet out of their normal territory. I submit that the last of the new songs, “So Simple, So Profound,” might be the least “Inspirations-like” song the Inspirations have ever recorded. Evidence: no piano! David Johnson’s acoutic guitar is the only instrumentation on the track, making it sound more like something the Isaacs would sing than the Inspirations. The result is a breathtaking acoustic ballad. This is not a knock on anyone, but this is just not a song that Archie Watkins, Eddie Dietz, and Ron Hutchins could have sung, at least not with the smoothness of blend that these Inspirations employ. The title of the song really says it all: take one simple instrument, a simple lyrical hook, and four voices singing with no frills, and you get something so profound that you would never expect on an Inspirations record. I can see this going over very well in concert with instrumentalist Luke Vaught backing the quartet. Or they could aptly do the whole thing a cappella. The song is definitely worth your listen. I believe the Inspirations are one of the best-sounding quartets on the road right now, and if you want traditional quartet singing, you’d be hard pressed to find it done any better. It’s in the Savior’s Hands is not, for me, quite on the level of the 5-star God Makes No Mistakes from last year. By trading a couple of the weaker re-cuts for more strong new songs, it may have gotten there. 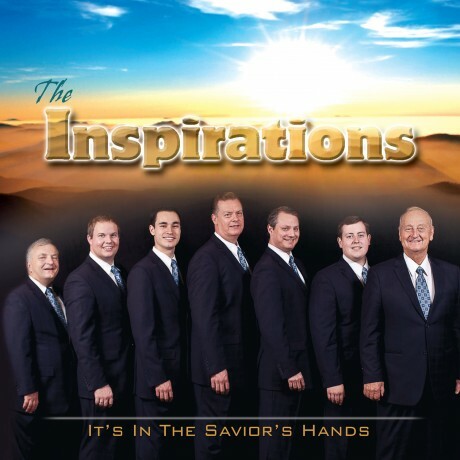 Still, it is my favorite quartet recording of 2012 so far, and it’s definitely worth a look for any southern gospel fan. By overlooking something you may think is too simple, you might lose out on something profound. Thanks for the review and the kind words Brian! We sure do appreciate it! All the credit goes to you guys for making this music we all enjoy, and to the Lord for blessing you with the ability and desire to do so.